In theory, none whatsoever, because you are already compliant and the main change is the way they inspect. In practice, the major turmoil is going to be the way you have been gathering and filing your information. If you had been following our methodology, then once again, there is nothing to change to be able to present your evidence and files to the inspector. In reality, thousands of Providers have purchased systems which are designed to organise the evidence around the 175 odd prompts and then filed under the 28 Outcomes. Unfortunately for these Providers, the prompts and outcomes have now gone, and replaced with a completely new format. The result is that your evidence is of course still valid, but it’s filed completely ‘wrongly’ now when an inspection takes place under the new regime. Your filing system will have to adapt to the new system in October if you want to present evidence quickly and logically. However, you are still stuck with the old data being filed differently, and it is probably not worth going back to reorganise this now. If you imagine an inspection in February 2015, half your evidence will be filed under the old system, and the other half in the new system. You will just have to suffer this as a temporary problem. The lesson to be learned if you are in this situation is not to organise yourself too rigidly to official guidelines because these are set to evolve and will continue to change at regular intervals. 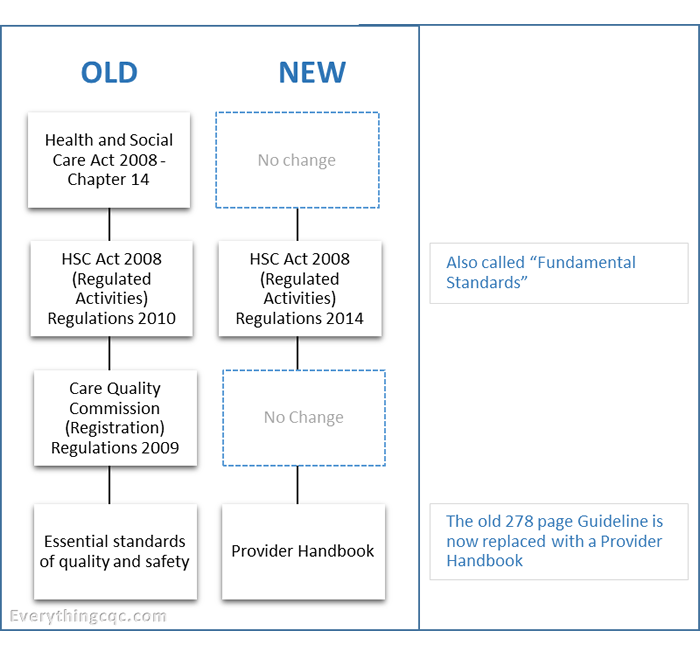 The new CQC inspection regime – Will you pass? From 1st October 2014, the old 28 Outcomes system is out, the new KLOE based system is in. What documents they will request before the visit. To reduce the time looking at paperwork on the day of the inspection the CQC inspector will request a list of key documents to be sent to them prior to the visit. Though times scales vary our client experience is that they will ask for documents to be submitted at least one week in advance to allow the team enough time to look through them. About 50% of the documentation requested was standard practice policies and protocols. If you have everything in place, putting together this documentation should take no more than an hour. Examples of the types of things asked for: The practice’s Mental Capacity Act procedure and infection control policy. Other evidence based documentation requested were things like e.g. incident reports; minutes of meetings; details of your most recent QOF data, etc. Again providing this information is pretty straightforward, but may still take an hour or two to put together. The “Good” side of things is that this is all pretty straightforward, if you are already reasonably well organised. The “Bad” side is usually when you have not been monitoring and maintaining records as you go along, and may well suffer a panic attack as you discover that just collating complaints data alone is going to take you a couple of hours. What is most time consuming, and may well take up to a couple of days or more, is mapping the KLOEs against the services you provide to the various population groups, and finding the evidence for it. The New inspection model is based around the KLOEs (Key Lines of Enquiry) for the 5 domains (Click here to get to know KLOEs). Click here to view a copy of the CQC descriptions of the six key population groups, including characteristics of good and links to key lines of enquiry. - New 'Duty of Candour' makes it a criminal offence if patient is not told true facts of incidents, in a face to face meeting. - New 'Fit and Proper Person' test became a statutory duty. It is an offence not to comply or if you do not remove an unfit person from the management.